Call us at (734) 285-0020 today. Wyandotte chiropractor, Dr. David Silbert takes a functional medicine approach to your health care. At Silbert Chiropractic Clinic, we use evidence gained from our comprehensive assessment program to determine how best to help you. For nearly 30 years, Dr. David has helped people to live a more active lifestyle. Athletes from the high school to professional level have seen injuries heal and their performance improve under care at our office. Area track, basketball and softball teams often see us, and we’ll even watch a recording of your events or practice to evaluate how we can help you. Dr. David’s comprehensive assessment process includes a functional movement assessment to determine where your problems are. He’ll work with you to get you better quickly. You won’t have to return to our office for repeated treatments. Instead, care plans usually involve no more than 12 visits. We welcome you to return when you feel you need us again. Revitalize your health naturally! Contact us today to schedule an appointment. We’re honored to be your choice for a Wyandotte Chiropractor! For more information or to schedule an appointment with our Wyandotte chiropractor, call (734) 285-0020 today! David Silbert, D.C. is a chiropractor serving Wyandotte and the surrounding area. Our chiropractor and the rest of the welcoming team at Silbert Chiropractic PC and Functional Rehabilitation are committed to providing chiropractic solutions to address your unique needs, whether you are experiencing back pain, neck pain, headaches, or even muscular tightness and tension. You may be searching for pain relief after an accident, experiencing an injury, or if you suffer from a specific condition like chronic back pain or a spinal condition. Even if you are looking to improve your overall health, our chiropractor can help you attain your everyday wellness goals! Visit our testimonials page to find out what our patients are saying about our Wyandotte chiropractor and our chiropractic care plans. 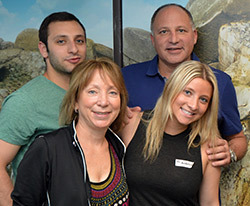 At your first visit to Silbert Chiropractic PC and Functional Rehabilitation, David Silbert, D.C. will explain how chiropractic care works and give you a full evaluation to see if our chiropractic solutions are a good fit to address your needs. If there is a good fit, we can customize a plan of chiropractic care for your condition and health goals. If you have not been to a chiropractor before and want to find out more, please contact us or call (734) 285-0020 to receive the answers to your questions from our experienced team. We also welcome referrals, so we invite you to share our chiropractic and wellness information with your friends and loved ones.